Every brand wants to stand out in today’s crowded marketplace. However, with increasing sensory overload, it is becoming hard to stand out. What can brands do to distinguish themselves? Following these 4 marketing trends may help you stand out in 2016! 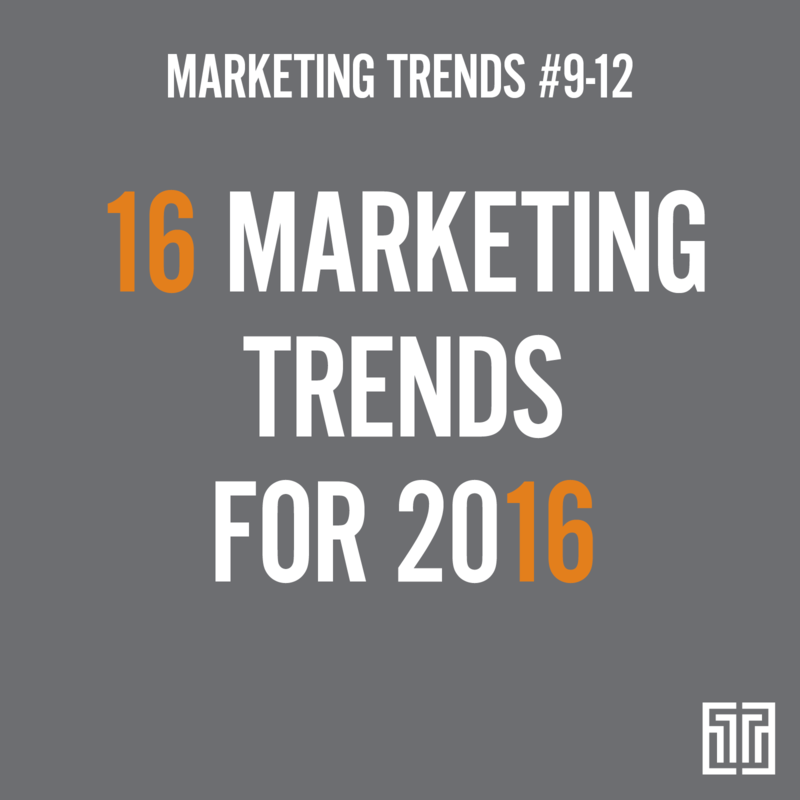 If you missed the other marketing trends, check out our blog series “16 Marketing Trends for 2016”. 2 Pulizzi, Joe. “What Effective B2B Marketing Looks Like [New Research]”. Content Marketing Institute. 30 September 2015. Web. 1 October 2015. 4 Google’s Brand Lab. “Building a YouTube Content Strategy: Lessons From Goggle BrandLab”. Google’s Brand Lab. July 2015. Web. 1 October 2015. 5 n.p. Animoto.com Survey (featured in NY Times, CNN, NBC, Bloomberg). n.d. Web. 1 October 2015. 7 Bell, Sharon. “Five ways to improve your mobile-friendly e-commerce site”. NetElixir.com. 24 June 2014. Web. 1 October 2015. 8 n.p. “Top 10 Email Clients”. Andestra.com. September 2015. Web. 1 October 2015. 9 Harvard Business Review. “For Mobile Devices, Think Aps Not Ads”. Harvard Business Review. n.d. Web. 1 October 2015.